The discussion of mitigation measures mentioned on this webpage does not constitute an endorsement by TIRF and are provided for information and education purposes only. Click here to view a list of mitigation measures. Wildlife-vehicle collisions (WVCs) pose a serious risk to people and various animal species across Canada. They can result in severe injury or death for drivers and other road users, along with associated significant costs, up to $200 million annually. For instance, in a review conducted in 2003 for Transport Canada, in one year 17 people died, 2,003 people were injured, and there were 37,754 reports of property damage due to collisions with animals. These figures only represent those collisions that were reported, meaning the actual numbers are much higher. The impact on wildlife is just as problematic. Increased land use and human development have further encroached into wildlife habitat areas, diminishing food and water sources for animals, and creating barrier effects between habitats. Equally important, road mortality is a leading factor for over 30 species designated as threatened or at risk by the Government of Canada. Numerous efforts have been made to reduce and prevent WVCs. Many of these mitigative efforts have been employed for decades, such as wildlife signage and fencing while other efforts, such as solar-panelled roadways, represent emerging ideas. Solar roadways consist of solar panels that can sense when an animal is on the road and alerts drivers who are approaching the hazard (see below for more details). Despite the various measures used to mitigate WVCs, a large number have not received sufficient study and analysis. This is important as some measures may not only be costly but could also be largely ineffective. Among the more rigorously studied mitigation measures, such as exclusion fencing, analyses can still be limited due to confounding variables. These variables may be difficult to measure or include in the analyses given that research takes place in an uncontrolled environment – unlike laboratory research – with changing weather conditions, animal movements, vehicle densities, and different road structures among a host of other difficult to control variables. In addition to the above, while studies may determine whether a mitigation measure performs well, often studies fail to determine if the measure has an impact on wildlife-vehicle collisions. For instance, some studies may conclude that deer can hear an ultrasonic device, but they may not have analyzed whether these measures translate into an actual reduction in collisions with deer. Evidence suggests that deer do not respond to deer whistles. Furthermore, the costs of some mitigation measures may be too prohibitive to implement in some areas. A brief look at new technologies as well as the sources used to develop this web page have also been provided following the list, which may prove useful for those interested in further information and details. For a brief overview of some of the research concerning mitigation measures, click here to download a handout on Mitigation Research. Efforts to educate the public or disseminate information on road safety and collisions with wildlife species are intended to modify human behaviour as a means to reduce collisions. Public education may come in the form of publicity campaigns or handing out information at park entrances. These methods are generally carried out during peak collision periods (such as the spring and fall) or in high collision locations (such as national parks). As of yet, there appear to be no studies that have evaluated the effectiveness of public information/education on the number of collisions with animals. Advantages. Improving public knowledge about various types of wildlife behaviours and appropriate driver responses to potential collision situations can be important steps to reducing collisions or the extent of the impact on humans and wildlife. 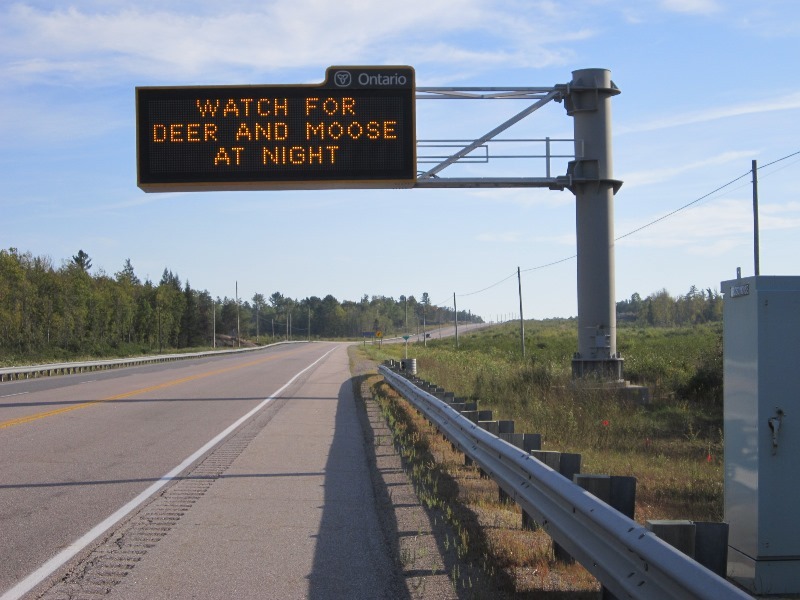 For instance, education campaigns can teach drivers the different responses required when faced with a deer versus a moose collision, which might improve the outcome for the driver and the animal. (For example, see the Road Safety web page for educational materials for the Canadian public). Information provided to the public during peak collision times may also help to serve as reminders as well as potentially raise overall driver attention to driving conditions. Provision of education and information, depending on the format and medium used, can be inexpensive such as online formats or handouts of one-page printed pamphlets. Public education also maintains the issue in the public eye; therefore, when other, more costly mitigation measures are proposed, the public is more familiar with the issue and can see that alternative techniques have been employed. Disadvantages. The information and education provided to the public must be accurate and based on expert information or evidenced-based research. With mediums such as the internet and social media, inaccurate information can be easily disseminated and difficult to control. Provision of education and information, depending on the format and medium used, can be expensive such as multi-year commercial advertising campaigns. Reduction of speed limits along sections of road with high wildlife concentration and movement is intended to improve driver response times to the presence of animals and reduce crash severity. 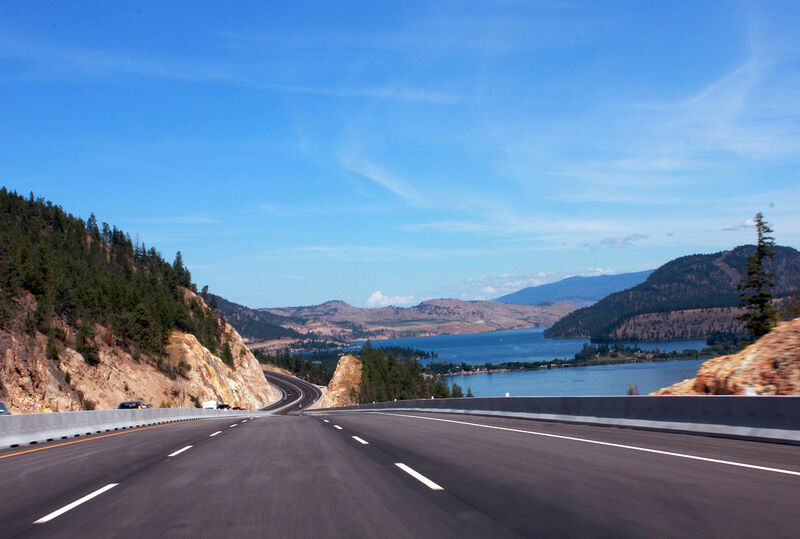 Speed limits are sometimes lowered along roadways originally designed for higher speeds, but where high numbers of WVCs have prompted road agencies to lower speed limits, such as within Canada’s National Parks. Studies have thus far revealed limited to no improvement in reduced collisions with animals. Advantages. Reductions in speed, even by as little as 5 km/h, have been shown to have significant effects in reducing the severity of collisions in general. Disadvantages. Studies of speed reduction effects have largely shown no significant improvements in WVCs, and in some instances increased collisions. Explanations for these results include increased traffic density, where there are no gaps for wildlife to safely cross and changes in animal movement and/or behaviour. However, studies have also pointed to issues involving human behaviour. These include drivers who disregard speed limits that are significantly low, particularly where the road design was built for faster speeds; or speed dispersion, where the differences in speed between drivers who disregard slower speeds and drivers who obey reduced speeds are great and contribute to unsafe passing. To overcome the problems associated with drivers who speed through high WVC areas, some jurisdictions design roads for slower speeds or make use of traffic calming measures. 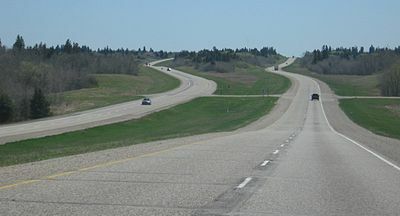 To create lower design speeds roads may be altered by making curves sharper, lanes narrower, narrowing of clear zones (the vegetation areas alongside roads), or by removing shoulders. Although traffic calming designs are more typical in urban settings, some jurisdictions have used speed bumps, rumble strips, “slow points” (reducing the width of sections of road such as forcing cars into one lane) in highway settings. Initial studies seem to indicate that road designs which reduce speed reduce collisions with wildlife. However, there are mixed results depending on the type of design/calming measure used so more research is required. Advantages. As speed is considered an important factor in WVCs and severity of collisions in general, lower design speeds/traffic calming methods force drivers to travel at safer speeds. Traffic calming measures can be used in urban areas to reduce collisions with small wildlife. Disadvantages. The costs to modify existing roads for slower speeds can be expensive. The time to reach destinations takes longer and it is possible drivers may become more frustrated in areas of congestion or slower speeds. Studies indicate that not all design speeds or traffic calming measures produce the desired results. For instance, narrower clear zones have been shown to increase collisions due to reduced driver visibility of the surrounding area. Some traffic calming measures are difficult to maintain during the winter due to uneven pavement and snow clearance machines, while most cannot be used on roads with high speeds. The most common mitigation measure used to help reduce wildlife-vehicle collisions are wildlife crossing signs. Their purpose is to warn drivers of the possibility of wildlife in the area, generally at high-wildlife crossing or collision locations. There are several types of crossing signs which can be generally categorized as caution signs, enhanced caution signs, seasonal signs, dynamic message signs, and animal detection systems. Caution signs are constructed of yellow and black reflective images and are installed in high-volume wildlife crossing areas. They depict an image of the animal or animals a driver may encounter on the road. Advantages. Traditional caution signs are inexpensive and can easily be installed along any roadway where exposure to wildlife is considered high. Disadvantages. Drivers typically become accustomed to the presence of traditional wildlife signs and either do not notice them or disregard them. The signs are permanent and cannot accommodate changes in animal movements unless relocated. 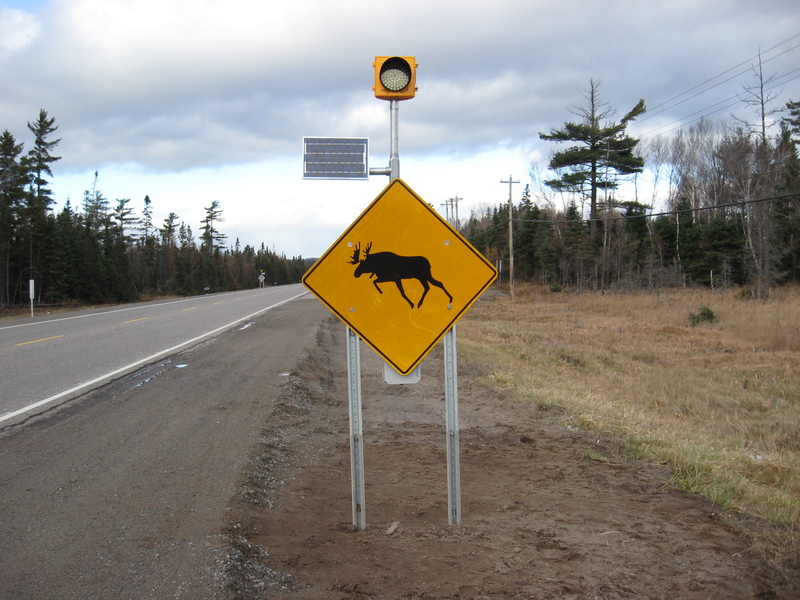 Enhanced caution signs are similar to caution signs but they add an advisory or warning of some type, such as stating the number of kilometres the warning is in effect, inserting terms such as “MOOSE XING”, or adding neon lighting to draw attention to the sign. The purpose is to improve the likelihood of drivers observing traditional caution signs. Advantages. As with traditional caution signs, most enhanced signs remain relatively inexpensive. The signs also increase the visual cues to drivers in high-volume wildlife crossing areas. Disadvantages. Some studies have shown that enhanced crossing signs do not significantly alter driver behaviour in comparison to traditional caution signs while other studies have shown some effects. The signs are permanent and cannot accommodate changes in animal movements unless relocated. Seasonal signs are used only during peak animal activity periods, typically during animal migration in the spring and fall. These signs are able to be modified, such as through changing what is displayed on the sign or moving the sign to different locations. Many of them also are designed with flashing yellow lights or add caution flags to bring greater attention to the signs. Advantages. The use of seasonal signs helps deter drivers from becoming accustomed to the presence of permanent signs. 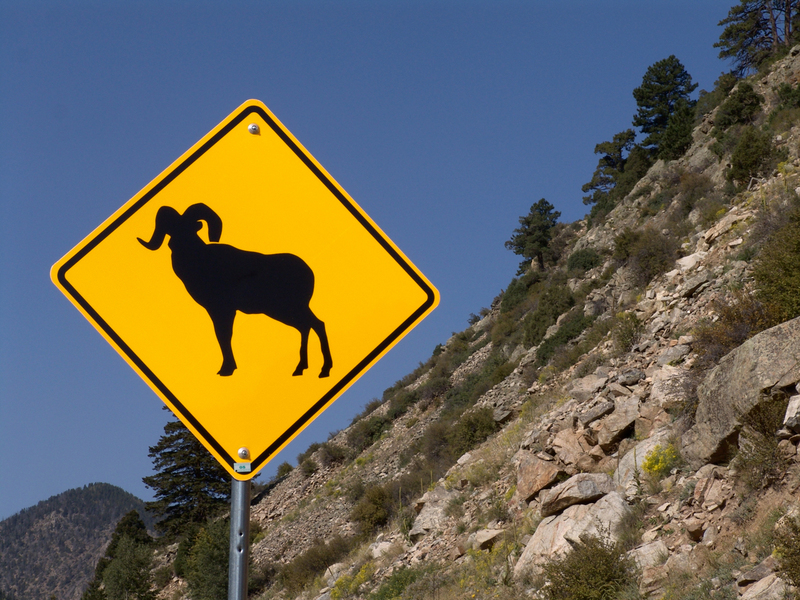 The appearance of new signs during peak animal migration periods also serve as a reminder to drivers of the high risk season. Additionally, these signs are often different from traditional highway warning signs and thus better at gaining driver attention. The signs can be moved to optimum locations that can accommodate potentially different animal migration patterns over the years. Disadvantages. Studies have revealed different findings in the effectiveness of seasonal signs. In some instances, researchers reported that drivers slowed down and took precautionary measures in response to the warning signs, while in other studies drivers did not significantly alter their driving habits. Dynamic message signs are electronic signs that display messages to drivers. The signs may be permanent, such as signs that span across the top of a road, or they can be portable, such as signs mounted on trailer units. The messages on the signs can be changed to suit the current conditions of the road, including warning drivers about wildlife. Advantages. In many cases, the messages to drivers can be tailored to the current road conditions. Newer signs may have additional visual stimulation such as flashing words or changing dialogue, which are more likely to attract driver attention to the warning. Disadvantages. 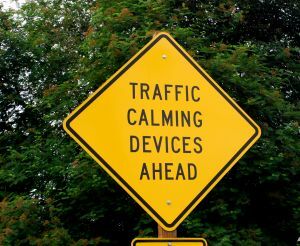 Similar to other permanent signs, the permanent message signs have been found in some studies to be less effective than the portable signs in altering driver behaviour. The messages may not be up-to-date at all times. Dynamic message signs are also more expensive and sometimes subject to malfunctions or breakdowns. Animal detection systems are sign systems that alert the driver, usually through flashing lights, to animal movement detected on or near the road. Generally, the sign is affixed with a flashing light system that is connected to detection sensors further down the road.The two most common detection sensors used are ‘area-cover’ systems and ‘break-the-beam’ systems. Area-cover sensors detect movement within a set range radiating out from the sensor, while break-the-beam systems are activated when animal movement blocks infrared light transmitted between two or more sensors. When an animal triggers the sensor, a signal is relayed back to the sign activating the lights to warn drivers of potential animal hazards up ahead. Advantages. Electronic signs are more likely to catch the attention of drivers and because they are generally activated by wildlife movement drivers are more likely to heed their warnings. Advances in technology such as solar panels have expanded their use in more remote areas where wildlife is more common but electrical sources may not exist. Disadvantages. Animal detection systems are typically only designed to detect large animals, therefore, smaller wildlife could still go undetected and pose a hazard to drivers. Some systems also can produce “false negatives” where animals are present but the system does not detect them, or can produce “false positives” where the system activates the warning when no animals are present. Some systems are not as effective for high-traffic roads and some are affected by changing weather conditions. Finally, these systems are more expensive relative to traditional signs and are subject to malfunctions or breakdowns. As technology improves, vehicles are increasingly outfitted with new safety features that assist drivers in responding to road hazards. 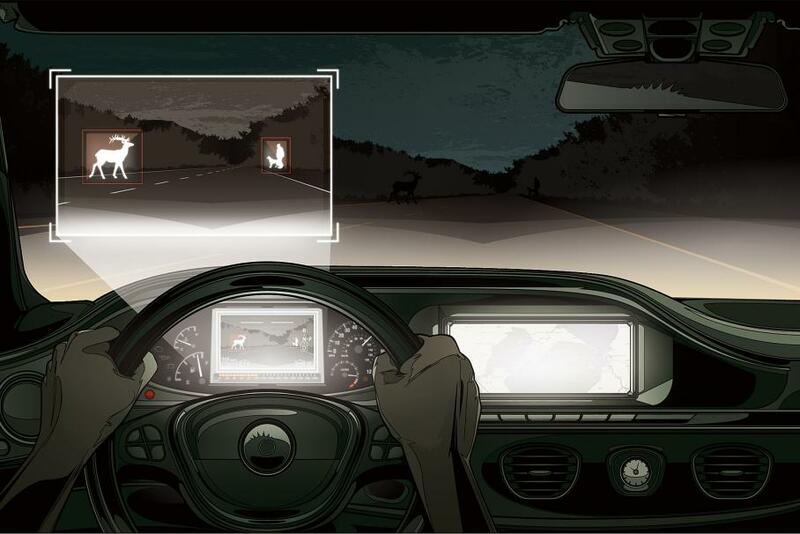 With respect to wildlife, several automakers have developed in-vehicle detection systems that can detect animals at distances further along the road or beyond the lit area produced by headlights. There are generally two types of systems, active and passive systems. Active systems use an infrared camera which illuminates the road to detect heat sources. Passive systems gather heat already emitted by the sources rather than using a light source to radiate light. Each system provides the driver with a display of the heat source(s) and emits warning signals as appropriate. Advantages. As this is a newer technology, it has not received sufficient examination to draw any general conclusions. However, potential benefits appear to include earlier detection and warning to drivers. Disadvantages. Like all vehicle safety features, there is a risk that drivers may not know how to use the vehicle safety feature properly, or they may rely on it to compensate for poor driving habits. Detection systems also have limitations, such as the inability to see through solid objects like other vehicles or the inability to see around curves. Further limitations include reduced detection in fog or rain, and some systems have short ranges. Not all vehicles are equipped with detection systems and their cost may be a deterrent to car buyers. The majority of wildlife-vehicle collisions occur between dusk and dawn. Driver vision is limited and the natural camouflage colouring of most animal species decreases the ability of drivers to see and respond to wildlife on or near roads. The purpose of roadway lighting is to increase driver ability to see the road and surrounding environment. With respect to WVCs, however, very few studies have been conducted to analyze the impact of roadway lighting. Of these few studies, the results suggested that roadway lighting had no effect on reducing collisions. More research is required. Advantages. The expected benefit to roadway lighting is that it will increase driver range of visibility during the night, allowing drivers the ability to see wildlife at further distances and thus be able to react sooner. Disadvantages. The costs associated with setting up and maintaining roadway lighting on rural roads are expensive. Due to the limited number of studies on roadway lighting, it is still unclear if certain animals are attracted to, or avoid, lit roadways. In addition to speed reduction methods (see above), other road design measures have been suggested or employed to reduce WVCs. Some methods have been tested and analyzed, but the results have been mixed. For instance, some studies suggest narrowing lanes to reduce vehicle speed; however, testing of this on highways that have been altered have either demonstrated no change in WVCs or have shown reduced collisions for some species and increased collisions for other species. The use of grass medians or medians with barriers also has demonstrated mixed results. 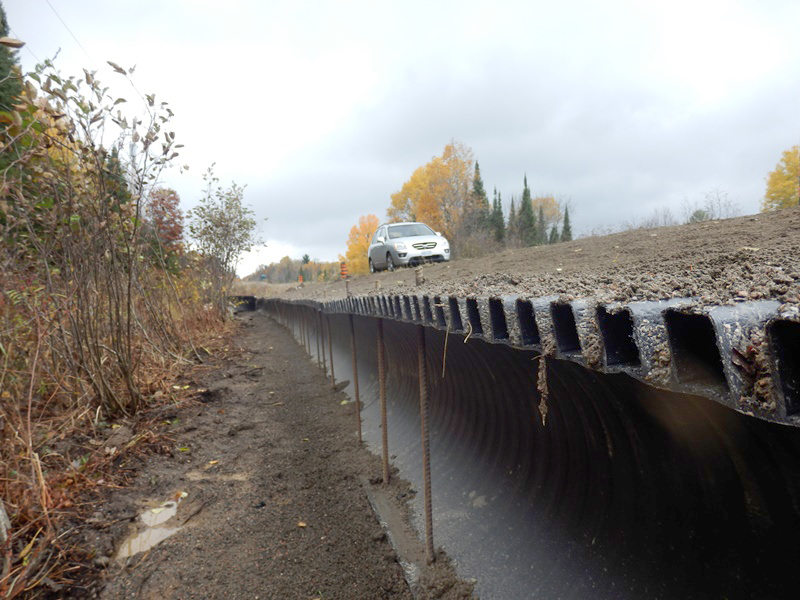 Another option is the use of long vehicle bridges and tunnels that allow wildlife to pass under or over the road. With the exception of tunnels and long bridges, research on the effectiveness of some of the other designs and the ability to reduce collisions does not appear to have been conducted as of yet. Advantages. Long tunnels and bridges are able to physically separate vehicles from animals and research has indicated they can be effective in reducing WVCs. Disadvantages. Since data and research on wildlife-vehicle interactions are limited and it can be difficult to predict where along a planned roadway high wildlife concentrations will occur, it can be challenging to accurately determine where and how to alter road design. Alterations also may increase the construction costs depending on the extent of the modifications. Increasingly, various agencies involved in the construction of new roads take into consideration the impact the route may have on the surrounding environment in order to create an ecologically sensitive road. Planning often involves attempts to limit or avoid routes that would bisect important biodiversity zones, that would cause high WVCs, or that would adversely affect the environment among other considerations. Not enough research has been conducted that analyzes the impact of alternative route selection on the reduction of collisions with animals. However, some research has been conducted on characteristics that appear to correlate with high collision locations. For instance, wooded areas and areas that bisect important wildlife migration roots tend to have more collisions with certain animal species. This type of information can be used to improve routes or aid in the design of new routes. Advantages. Purposely selecting routes that address road ecology and road safety problems before they begin can have an impact on WVCs. Additionally, safety of humans and animals could be improved. Disadvantages. Ecologically sensitive roads may be more expensive to construct depending on the number of adjustments required. To be effective at reducing wildlife collisions, multiple sources of data and information must be examined to help design the most appropriate route. However, data on animals (see Data on WVCs), their movement, the habitat, and wildlife-vehicle collisions, although improving, are still largely limited and can therefore make route planning difficult. Painting wider lines (highway striping) along the edges of roads may help drivers spot animals on the road at night. An animal that strays onto the road will produce a visible break in the solid line, thus acting as an alert to the driver to be aware of something on the road. The effects of wider striping do not appear to have not been studied. Advantages. Relative to several other mitigation measures, it is lower in cost and can be easily implemented. Disadvantages. Studies have not assessed whether the measure would be effective in reducing WVCs. Driver behaviour may negate the effects if the driver does not recognize or respond to the potential hazard. A number of jurisdictions in various countries including Canada, the U.S., and Norway have initiated reflective collaring/tagging efforts to help make wildlife such as bison, deer, and reindeer more visible to drivers. A collar or tag with reflective properties is attached to wildlife animals that spend their time around roadways and high collision locations. The impact of collaring has not been sufficiently studied. However, factors such as cost, stress to animals that receive a collar/tag, and maintaining adequate numbers of collared animals have been raised as potential impediments to this mitigation effort. 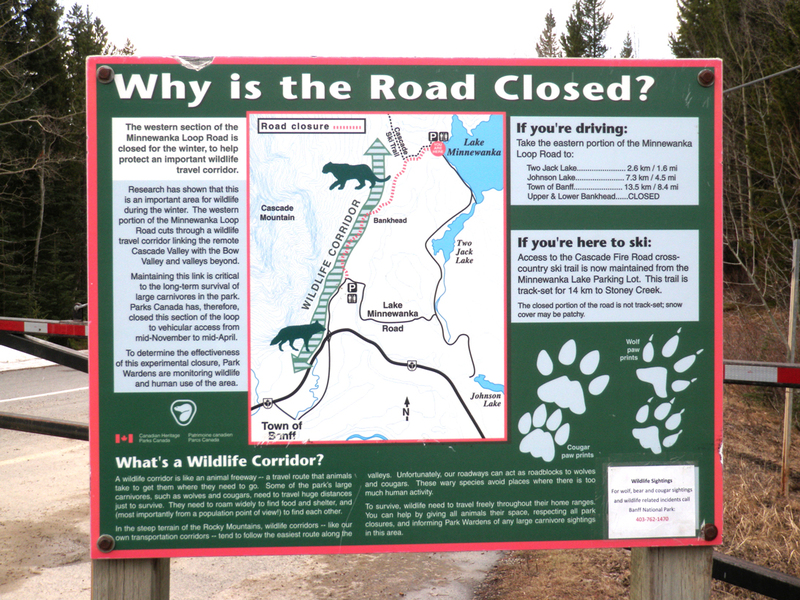 Some jurisdictions such as Banff National Park in Alberta or Rondeau Provincial Park in Ontario temporarily close certain roads that intercept wildlife corridors in order to allow for the movement of different animal species, (e.g., wolves, cougars, and other carnivores in Banff or snakes and turtles in Rondeau) during peak times. This helps to protect the bulk of the affected animal species and reduce collisions with vehicles. Example of an untreated roadside salt pool/mineral lick, BC. A large number of jurisdictions use various forms of sodium (salt) products as a means to remove ice from roads. The salt accumulates and eventually melts and drains into roadside ditches often creating what are known as ‘salt pools’ or also referred to as roadside ‘mineral/muck licks’. 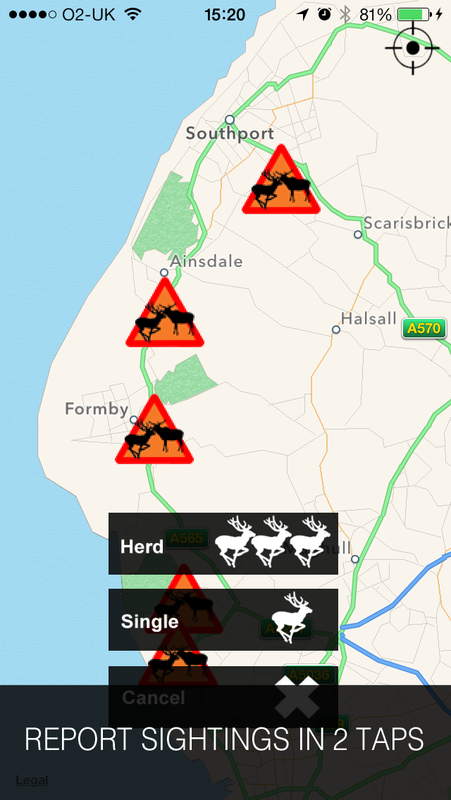 Wildlife species are naturally attracted to salt and often seek the road and run-off areas beside roads as a salt source, particularly in the winter when food is scarcer and salt intake is low. Options to reduce wildlife-vehicle collisions related to salt pools include using an alternative de-icing agent, draining salt pools, covering them with materials (e.g., rock, bark mulch, logs), or moving/providing new salt pools or salt licks that are not near roadways. Preliminary research has demonstrated that there is likely a relationship between roadside salt pools and wildlife-vehicle collisions (i.e., hotspots for collisions); however, more research is needed. Example of a treated roadside salt pool/mineral lick filled with small rocks, BC. Advantages. 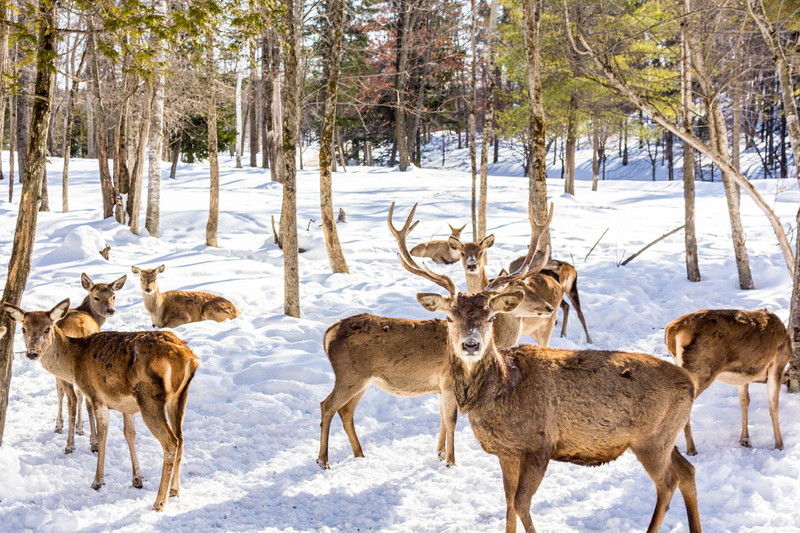 Providing wildlife with alternative salt sources such as salt licks or pools that are positioned away from roadways may prove less expensive relative to some other mitigation measures. Road salt has been found to be toxic to several types of wildlife species, while the disease brain worm found in moose and deer has been linked to the consumption of road salt by animals. As such, reducing its use could prove beneficial to wildlife and the environment. Disadvantages. Not enough is known about alternative de-icing products and whether these would be non-toxic to wildlife or if they would be environmentally friendly. 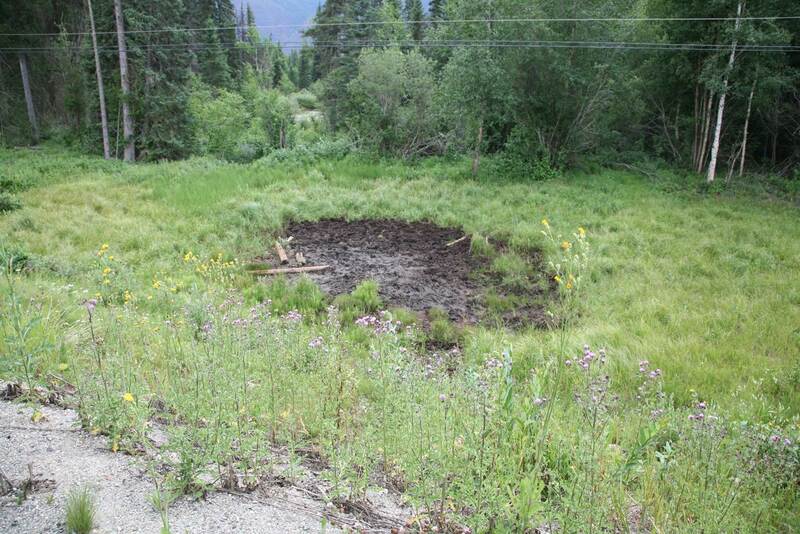 Some studies have shown that species such as moose appear to remember where roadside salt pools previously existed and therefore continue to return to those areas even though the pool has been drained or relocated. More research is required to determine if draining or moving salt pools would be effective in reducing wildlife-vehicle collisions. Efforts to reduce WVCs often include managing vegetation alongside roads (the “clear zone”) typically through mowing, removing, or planting low growth vegetation. Most vegetation is mowed or cut down in order to increase the driver’s visibility across the surrounding road environment. Tall/large vegetation or other objects such as trees or boulders are removed in order to reduce roadside hazards if a vehicle travels off of the road. Certain vegetation is often planted in order to discourage soil erosion, control other potentially damaging plant species, and as a means to enhance roadside appeal.There are few studies that analyze the impact of vegetation management on WVCs. However, initial studies suggest mixed results. In some cases, clearing of vegetation appeared to be connected to reductions in collisions while in other cases, cleared vegetation that improved visibility resulted in increased driver speed and some animals were attracted to the freshly mowed forage along the road. Additional research is required to determine the full effect of clearing vegetation on WVCs. In contrast, there is more research on species preferences and dislikes for certain vegetation as well as foraging behaviours, particularly in relation to deer. These studies analyze vegetation that is unappealing to certain wildlife as a means to deter animals from foraging alongside roads. Advantages. Mowing and clearing roadside vegetation improves driver visibility and reduces potential off-road hazards in the event of a crash if the vehicle leaves the road. Certain types of vegetation may act as deterrents to some animal species. Disadvantages. Not enough studies have been conducted to determine the general impact of vegetation management on the reduction of wildlife-vehicle collisions. Cutting away dead vegetation often exposes fresher vegetation, which is attractive to various animal species and makes vegetation easier for animals to access. Although some vegetation may be a deterrent to some animals, it may be desirable for other animals, making it challenging for decision-makers to determine what type of vegetation to use. Vegetation that is useful in deterring animals, protecting against soil erosion, or is easier to maintain may prove visually unappealing or harmful in other ways. With improved visibility, drivers may increase their speed leading to higher numbers of serious collisions. Clearing and planting long stretches of highway vegetation requires ongoing maintenance which can be an expensive cost. Roadside reflectors and mirrors are intended to deter wildlife from crossing roads at night where there are vehicles present. Their design is such that when a vehicle approaches the reflector, the light from headlights is reflected and dispersed into the roadside habitat areas or sometimes onto the roadway in order to frighten or distract animals from travelling onto the road. The reflectors often are made of highly polished steel and come in different colours, although red is the most common. Studies on reflectors have revealed a mixture of results ranging from ineffective, to mixed effectiveness, to inconclusive. Advantages. 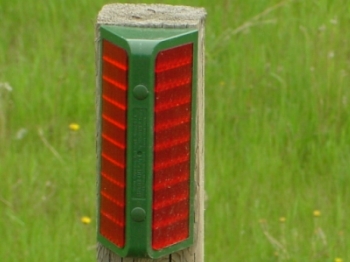 Reflective posts can alert drivers to high WVC areas. Disadvantages. The primary issue associated with reflectors is that several studies have not demonstrated their effectiveness, thus raising the concern that drivers may be overconfident about the effectiveness of these reflectors to ward off wildlife. Functionally, the application of reflectors is largely limited to nighttime conditions. Also, they require frequent maintenance and regular cleaning in order to work. Some studies have shown that deer become habituated to reflectors. Reflectors are also costly to install and maintain. Some jurisdictions, such as British Columbia, have chosen to discontinue the use of reflectors and phase out existing structures. Ultrasonic devices, more commonly known as deer whistles, are designed to alter the behaviour of deer in the presence of vehicles. The purpose of these devices is to emit noise within the deer’s hearing range that gains the attention of deer, either to stop them or scare them away. There are essentially two types of ultrasonic devices, air-activated and electronic. Air-activated devices are typically small plastic whistles affixed to the outside of a vehicle and are intended to emit a high-pitched whistle when air passes through them for vehicles travelling over 50 km/h. Electronic devices are powered by electricity and thus not limited to the speed a vehicle is travelling. Most studies have found that ultrasonic devices appear to have no discernible effect on deer behaviour. Advantages. There is no clear scientifically proven advantage to deer whistles. Disadvantages. The largest concern associated with ultrasonic devices is that due to their unproven ability to ward off deer, drivers may rely upon them instead of taking necessary precautions while driving. This is problematic given that deer collisions are the most common wildlife-vehicle collision. A number of studies that have examined deer whistles offer various reasons to explain their potential ineffectiveness. Such reasons include that not all devices produce the proper sound, either emitting too high or too low a frequency. Among air-activated devices, it was found that some do not produce any sound regardless of vehicle speed. Furthermore, they typically do not work at speeds below 50 km/h. Another issue cited was that even when deer appeared to hear the noise, they did not necessarily interpret it as a warning. For instance, some deer actually ran towards the sound. Researchers tested the range of sound for various deer whistles and found that many are drowned out by vehicle engine noise or other sounds in the area. Finally, studies have found that some devices do not emit sounds at great enough distances thus the noise may not be heard by deer from fast approaching vehicles. Some experts hypothesize that white-tailed deer raise their tails when frightened to expose their white underneath as a means to “flag” or warn other deer of danger. One study examined whether boards designed as deer with raised tails could act as a deterrent to deer. The study was unable to determine if there was an effect. Olfactory repellents use an application of either natural or chemical odours along roadside areas as a means to deter wildlife species from approaching roadways. The odours typically represent predators or may be unpleasant to animals. Studies of the effectiveness of olfactory repellents have been few and have revealed mixed results. Additionally, repellents require frequent application, particularly after rain or other adverse weather conditions, adding to their limited use. Aversion conditioning or hazing is a method used to frighten or create negative associations with roadways in order to repel animals or to reverse animal habituation. The negative stimuli used near roads may include bright lights, spraying animals with water, emitting loud noises such as gun shots or firing cannons, or use of predatory-resembling chases such as being pursued by humans or dogs among other methods of dis-habituation. There do not appear to be studies as of yet that analyze the effect of hazing on WVCs. However, a number of studies have been conducted on the effect of hazing on animals. Overall, the results are mixed ranging from having no effect or the opposite effect. Some results with limited success tended to reveal dis-habituation was not permanent and repeated hazing was likely required. 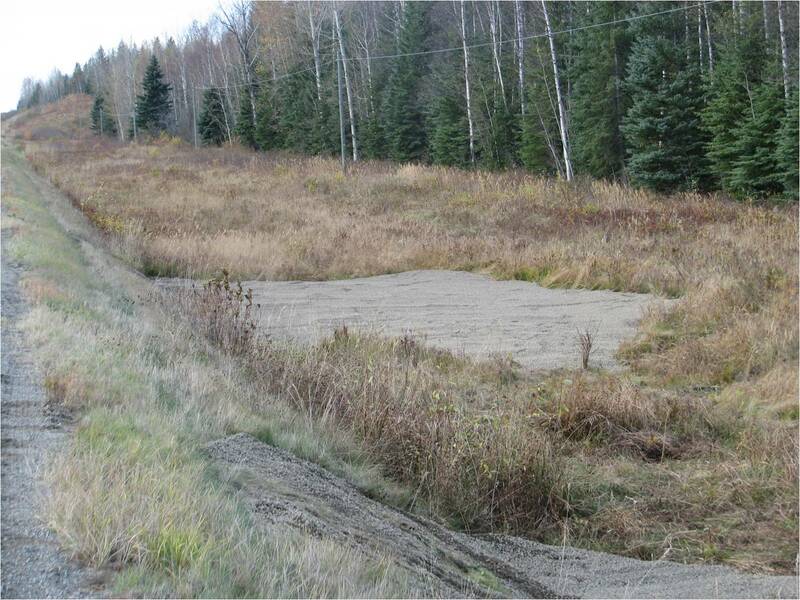 Intercept feeding involves placing food sources in areas that direct wildlife species away from roads. Not enough is known about the effects of this countermeasure. However, it has been suggested that the costs and probable short-term effects associated with feedings would likely outweigh the limited benefits. Exclusion fencing is intended to prevent wildlife from crossing roadways or to direct wildlife to specific areas, usually wildlife crossings where wildlife can safely cross roads. Generally, the fencing is designed with particular species and terrain in mind. For instance, fencing may be up to three metres high in order to prevent deer from jumping over it. Alternatively, it may have narrow spacing, such as mesh, at the bottom in order to prevent small animals like turtles, rabbits, or snakes from passing through it. The fencing may also extend into the ground to prevent animals from digging under it. Some fences may be electrified and produce a mild shock to animals that attempt to approach the fenced area. Advantages. If properly installed and maintained, fences are an effective means to reduce WVCs. When paired with wildlife crossings, exclusion fencing can help redirect animals to appropriate water and vegetation sources. Concerns have been raised about the risk of predation along fence lines, where animals can be trapped by predators. However, a few studies have shown that the number of animals saved from death or injury from a collision with a vehicle is much higher than the number killed by predators at fence lines. Fencing can be improved by the use of jump-outs or jump-pits. These are areas where animals trapped on the wrong side of exclusion fencing (e.g., on the side of the fence facing the road) are funnelled to an area of the fence designed to allow them to jump down onto the correct side of the fence (e.g., the forest side). Jump-out used with exclusion fencing. Disadvantages. The biggest disadvantage to exclusion fencing as a mitigation measure is the costs associated with it. Setting up fencing for long stretches of highways and conducting regular maintenance and repairs to the structure is expensive. In addition, unless fences are sufficiently long enough (e.g., greater than 18 km as found in one study) clusters of wildlife-vehicle collisions occur at the end of fence lines posing a concentrated risk to drivers and wildlife alike. Beyond mitigation, fences also produce barrier effects and can impede wildlife movement unless the fences lead to wildlife crossings. Electric fencing requires a source of energy to power it, which adds to costs and maintenance. 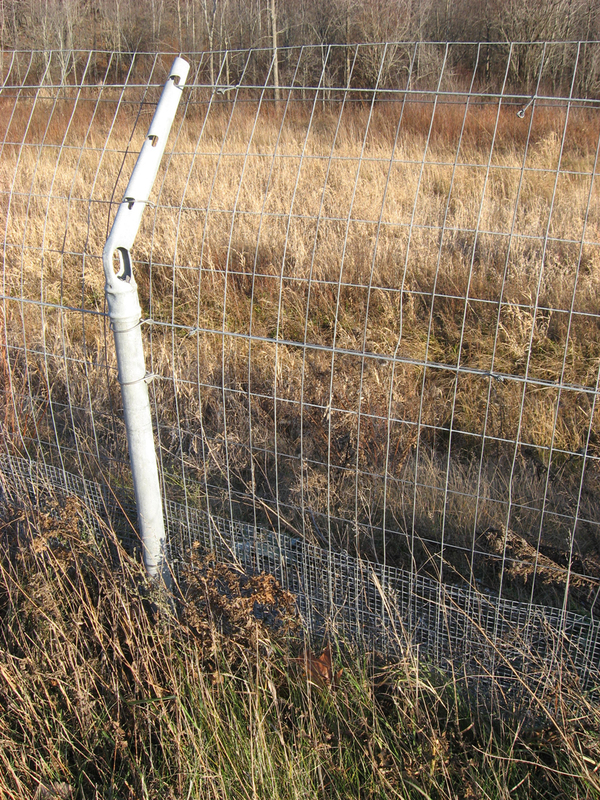 Fencing for one type of animal (e.g., deer, moose) may not be effective for another type of animal (e.g., turtles can slip through wide-spaced fencing; bears and cougars can climb over fencing; coyotes can dig under fences); therefore, fencing that can deter multiple animal species may be more complex and expensive to install. As a result, choices often must be made as to which animal(s) the fencing should deter. Exclusion fencing can also disturb the existing natural environment, both during construction and after installation, and therefore consideration must be given to the fact that fencing may have a negative impact upon the local environment. The Banff National Park overpasses are among the most well-known in the world and often used as models for other overpass structures. 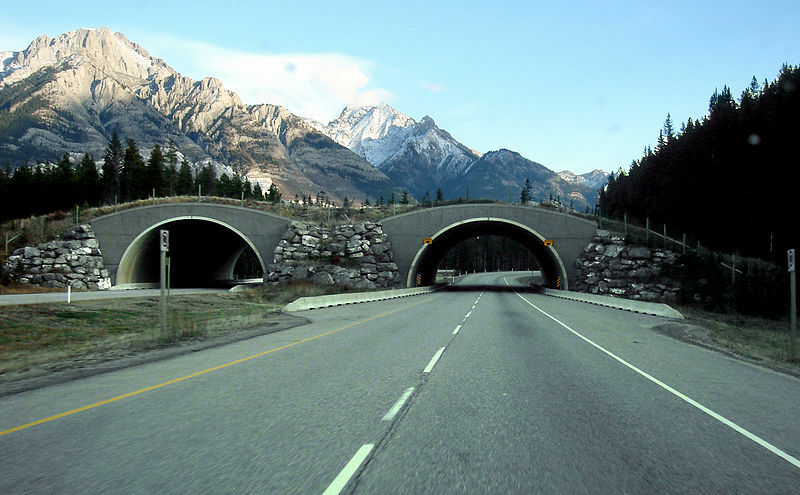 The purpose of wildlife crossings (also known as overpasses, underpasses, or ecopassages) is to provide means for wildlife species to safely cross roads, either above or below the road. Overpasses are designed in five different formats: land/wildlife bridges (typically large and covered with soil and vegetation); overpasses (typically smaller and used by humans or livestock); canopy bridges (ropes or poles suspended between trees or other structures above traffic); glider poles (tall vertical poles placed across roadway corridors that allow gliding species intermittent points to land and takeoff from); and traffic management (methods that reduce speed or volume of traffic such as cross walks, road closures, or signage). Underpasses are designed in three formats: culverts (typically square, rectangular, or semi-circle concrete shapes); tunnels/eco pipes (often round pipes with small diameters); and bridges (a structure designed for roads to elevate vehicle traffic above the surrounding environment to allow passage underneath). 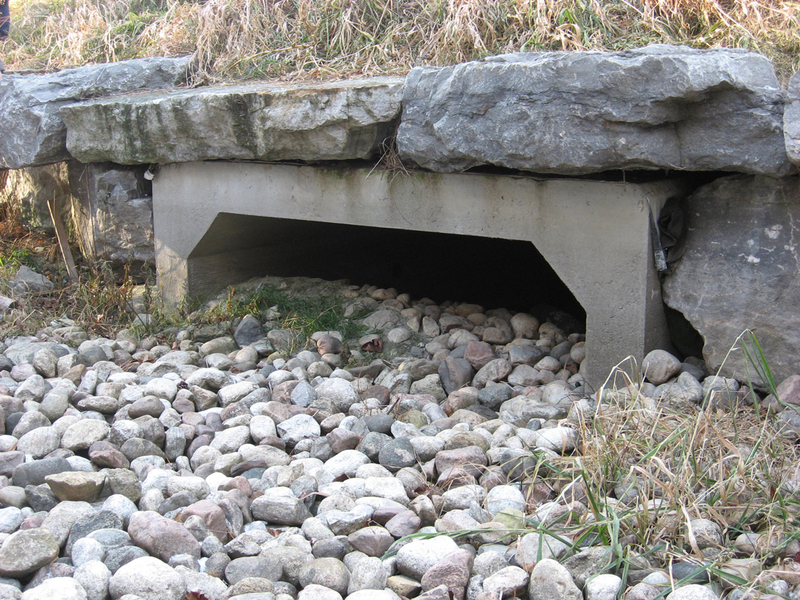 Not all underpasses or overpasses are designed for wildlife such as water drainage culverts or vehicle bridges, but wildlife may still make use of them. When purposely built for wildlife, crossings can be designed for any number of animal species. If designed with a specific animal species in mind and strategically placed in locations where animals are most likely to use them, they can be an effective mitigation measure. They are often built in conjunction with exclusion fencing or other types of barriers to funnel wildlife. This specific underpass is for turtles and other small animals. Advantages. When combined with exclusion fencing, wildlife crossings are considered one of the most effective mitigation methods to reducing WVCs. Disadvantages. The primary disadvantage to wildlife crossings is the costs involved in designing, building, and maintaining them. These can be significant due to the location (terrain), the materials required (construction materials plus the environmental materials such as grass and trees), and whether changes are needed to existing structures. Along with these costs, to be most effective the crossings require exclusion fencing to ensure wildlife cross at these locations, which adds another expense to crossing design. Furthermore, crossings must be placed at strategically appropriate places that correspond to wildlife activity, which can add additional study and design challenges. Culling involves practices to reduce the population size of a particular group of animals, typically deer, either through hunting or contracting professionals to kill members of the animal group. Culling has mixed results and has not been studied enough to make generalized conclusions. However, it has been estimated that to be effective in reducing WVCs a herd may need to be reduced by more than 50%. Advantages. If culling is encouraged through increased hunting, the value to hunters and local businesses may increase. In many jurisdictions, due to reduced predation and controlled hunting, deer populations have grown to sizeable herds and now burden the local environment. Culling is one method to help reduce wildlife populations to more manageable sizes that the local environment can support. Increasing hunting licences may be a cost-effective mitigative method relative to other measures. Disadvantages. It is estimated that to have an effective impact, a large proportion of the animal population needs to be culled (>50%), which may not be feasible. The public may object to culling. Hunters typically hunt male ungulates. However, herd reduction is more effective if females are culled. It is difficult and potentially a safety risk to cull animals close to urban areas or near highways. When hunting is not an option, hiring professionals can substantially increase costs. Good shelter/cover and food quantity or quality is associated with higher wildlife populations, thus altering the habitat near roads may help discourage wildlife presence or reduce their population size in the area. The effect of habitat alteration on WVCs does not appear to have been studied as of yet and only a few studies have analyzed the effect of habitat alteration on population sizes. According to studies, the effectiveness of altering wildlife populations is highly variable. Extrapolating from culling research, in order to reduce population size enough to be effective, a herd may need to be reduced by more than 50%. Advantages. This may be perceived as a more favourable option to culling. Disadvantages. Reducing the quality of the habitat could adversely affect the wildlife population and related environment. It may be necessary to provide alternative environments in other areas to compensate for reduced cover and quality food. Costs could be high in order to alter and maintain altered habitat areas. Relocation involves trapping, transporting, and releasing animal species to new habitats away from roadways and is often the alternative to culling. Further research is required to determine the effectiveness of wildlife relocation on collisions with vehicles. Advantages. This can be a more favourable approach in the eyes of the public than the killing or sterilization of various animal species. In many jurisdictions, due to reduced predation and controlled hunting, deer populations have grown to sizeable herds and now burden the local environment. Relocation is one method to help reduce wildlife populations to more manageable sizes supportable by the local environment. It is more suitable for use in urban environments. Disadvantages. Some studies have shown that some animals when relocated may leave the release area and many do not survive the stress of relocation often due to capture myopathy (i.e., a disease associated with capture or handling of any wild species). Experts note that there is often a low survival rate for animals that are relocated as they may not have the necessary immune tolerances required in the new area or food sources may be different, among other issues. Other animals, if not transported a sufficient distance away from their original habitat, return to the original location. The costs of relocating entire groups of wildlife can be expensive. An alternative to culling and relocation is to limit the ability of animal species to reproduce. This can be done by trapping animals and administering anti-fertility/sterilization drugs. According to studies, the effectiveness of impeding reproduction is highly variable. Furthermore, the impact on WVCs has not been sufficiently studied. However, by extrapolating from culling research, in order to impede reproduction enough to be effective, a herd may need to be reduced by more than 50%. Advantages. This may be perceived as a more favourable option to culling. In many jurisdictions, due to reduced predation and controlled hunting, deer populations have grown to sizeable herds and now burden the local environment. Limiting reproduction is one method to help reduce wildlife populations to more manageable sizes supportable by the local environment. Disadvantages. Sterilization is not effective in all animals and the effects typically only last for one to two years if successful; although, this could also be considered an advantage by allowing the option for reproduction at a later date if needed. Sterilization is more effective in small and closed herds, when herds do not mix with other herds. The costs of sterilizing animals can be expensive and capturing wildlife can be stressful to the animal. This technique is not considered appropriate near Canadian highways and sterilization drugs have not been approved for use within Canada. As technology advances, new options to help reduce collisions with wildlife vehicles become available. For instance, tests are underway that take driver-assistance technology one step further by reducing vehicle speed when the system detects animals on or near the road. Two other examples of emerging technology that are available but require further investigation and testing are Solar Roadways™ and mobile device applications (apps). 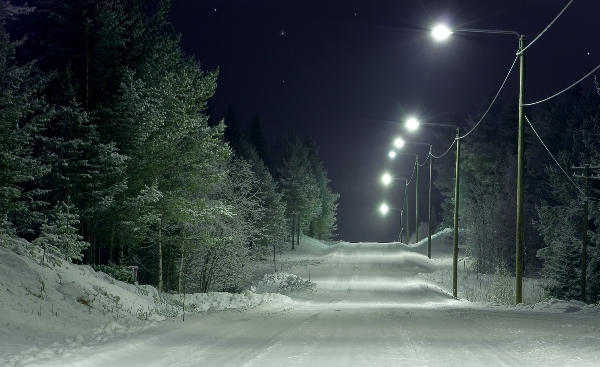 gathering solar energy and converting for electrical use, heating to melt snow and ice, and LED lighting embedded in the road that can be altered to the needed conditions. 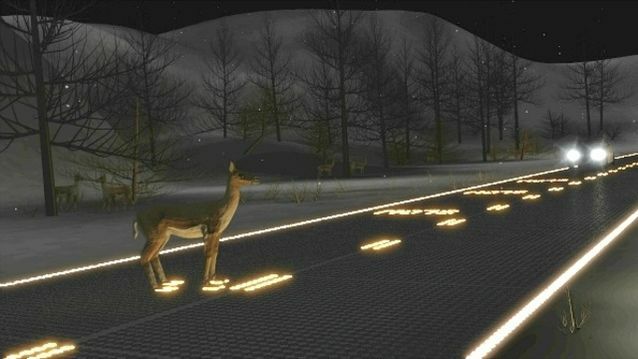 In terms of wildlife, the prototype panels also are designed to detect wildlife when animals step onto the road which then sends a message via the road panels to alert drivers in the area. Partially funded by the U.S. Federal Highway Administration and a crowd-funding campaign through Indiegogo, the panel system is currently undergoing tests. Many questions about the extent of the system’s feasibility and safety remain to be investigated. However, the product appears to offer a near-future mitigation measure with multiple potential benefits. Applications for mobile devices continue to add a number of tools for public use and some applications endeavour to reduce collisions with vehicles. Apps such as Avoideer are designed to make others aware of potential animal hazards. People record an animal sighting via the app which is then uploaded to the server along with GPS coordinates and date and time data. A notification is then pushed to other app users. When their mobile device nears the same GPS coordinates, the app emits a warning alarm and provides details of the hazard. No tests have been conducted to determine the effectiveness of this technology. Important: use of a cell phone while driving is considered a distraction and, if not hands-free, is illegal in most jurisdictions. If travelling with a mobile or electronic device where an alarm is emitted via the above or other applications, the driver should safely pull over to read the information or ask a passenger to do so for the driver. Aresco, M. J. (2005). Mitigation measures to reduce highway mortality of turtles and other herpetofauna at a north Florida lake. Journal of Wildlife Management, 69(2), 549-560.AvoiDeer. Mobile device application. http://www.avoideer.com/. (Accessed September 2014). Danks, Z. D., and Porter, W. F. (2010). Temporal, spatial, and landscape habitat characteristics of moose—vehicle collisions in Western Maine. The Journal of Wildlife Management, 74(6)i 1229-1241. Huijser, M. P., Duffield, J. W., Clevenger, A. P., Ament, R. J., and McGowen, P. T. (2009a). Cost–benefit analyses of mitigation measures aimed at reducing collisions with large ungulates in the United States and Canada; a decision support tool. Ecology and Society, 14(2), n.p. Huijser, M. P., Holland, T. D., Blank, M., Greenwood, M. C., McGowen, P. T., Hubbard, B., and Wang, S. (2009b). The Comparison of Animal Detection Systems in a Test-bed a Quantitative Comparison of System Reliability and Experiences with Operation and Maintenance: Final Report. Federal Highway Administration and Montana Department of Transportation. Huijser, M. P., Kociolek, A., McGowen, P., Hardy, A., Clevenger, A. P., and Ament, R. (2007a). 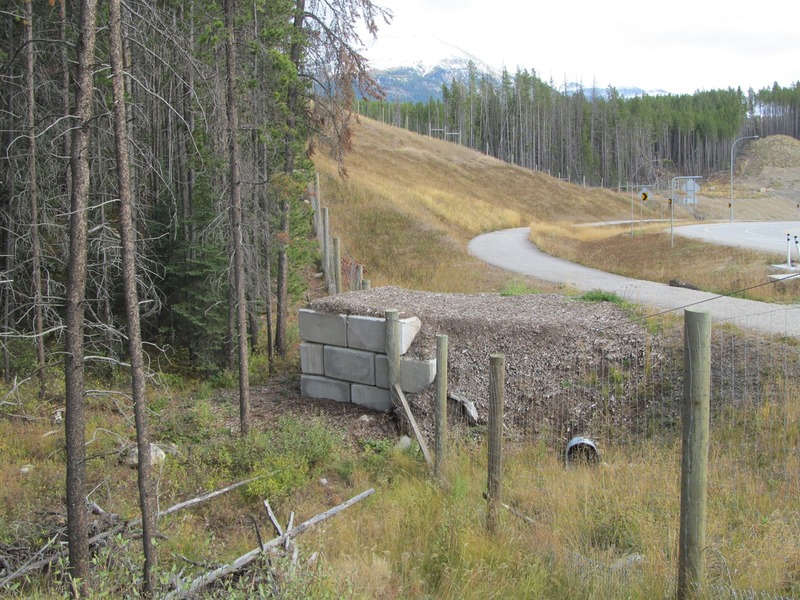 Wildlife-Vehicle Collision and Crossing Mitigation Measures: A Toolbox for the Montana Department of Transportation. Montana Department of Transportation. Huijser, M. P., McGowen, P. T., Fuller, J., Hardy, A., and Kociolek, A. (2007b). Wildlife-Vehicle Collision Reduction Study: Report to Congress. Federal Highway Administration, Office of Safety Research and Development. Mastro, L. L., Conover, M. R, and Frey, S. N. (2008). Deer–vehicle collision prevention techniques. Human-Wildlife Conflicts, 2(1), 80-92. Meisingset, E. L., Loe, L. E., Brekkum, Ø., and Mysterud, A. (2014). 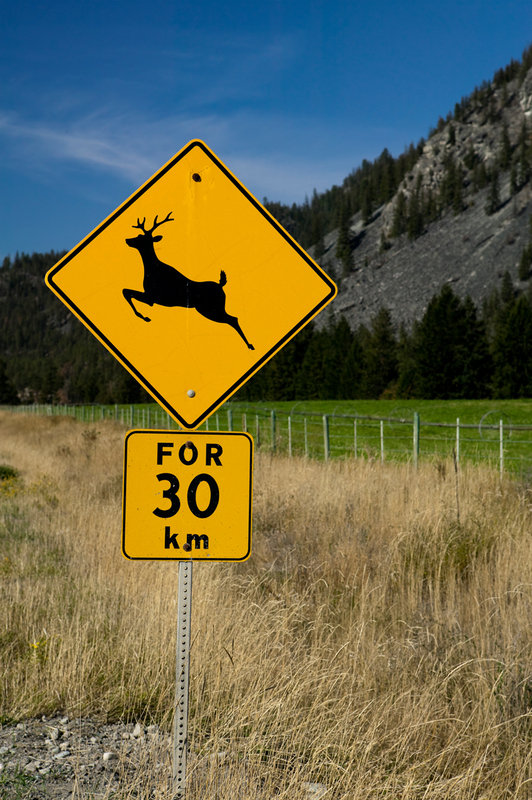 Targeting mitigation efforts: The role of speed limit and road edge clearance for deer–vehicle collisions. The Journal of Wildlife Management, 78(4), 679-688. Romin, L. A., and Dalton, L. B. (1992). Lack of response by mule deer to wildlife warning whistles. Wildlife Society Bulletin. 382-384. Vanlaar, W. G. M., Gunson, K. E., Brown, S. W., and Robertson, R. D. (2012). Wildlife-Vehicle Collisions in Canada: A Review of the Literature and a Compendium of Existing Data Sources. Ottawa, ON: Traffic Injury Research Foundation (TIRF).